Living with rabbits in the house takes some well though out plans. Read the article below if you are thinking about taking one into your home. If you would like to contribute to the writing on this JC Bunny Ranch send us an email. Next article about what it's like actually having a rabbit in your home. A pet rabbit can bring great joy to your life but you may need to be prepared to make compromises in your life style in order to comfortably accommodate a rabbit into your environment. Before bringing a rabbit into the home make sure you are prepared to provide adequate living conditions for your pet, to take the responsibility of caring for and protecting the life you are bringing into your home. If the rabbit is to be a pet for a child you must take the responsibility of supervising the care of the animal. Your rabbit will need a cage of adequate size. Even if you plan on allowing your rabbit the run of the house, a cage is recommended for those occasions when you must leave your rabbit alone or in case your rabbit should become ill. A cage becomes a safe haven and a place of security for a rabbit. A cage can provide quiet space for your rabbit of activity in the household becomes too much. A cage in which the tray slides out will be easier to clean and the easier it is to clean the more likely the job will get done as needed. Keep a supply of newspapers on hand to freshen the drop pan. Occasionally take the drop pan outside to wash off the build up. The cage should have a large door to make access to the rabbit easy and the door should open out not in. Keep the cage at a height that is convenient for you to access or visit with the rabbit. For children a cage on the floor may be ideal but for an adult the cage at table height may be much better. If you are going to allow the rabbit to get in and out of the cage on his own make sure the cage access is easy and not a dangerous leap for the rabbit. The rabbit should have a heavy crock for feed or a through the wire feeder. A heavy crock or water bottle that fits on the side of the cage will do well for water. If you use a crock for water be sure to wash it occasionally. Do not let fur or algae build up on the crock or in the bottle. Ideally give the rabbit clean water every day. However a 32 oz. bottle will hold enough water for several days for the light drinker. If you donâ€™t elect to refill the bottle everyday be sure to keep a close eye on the water level and donâ€™t let your rabbit run out of water. A litter pan in the cage is optional and depends on what your expectations for your rabbit may be. Some rabbits will train to a cage returning there to defecate, for some rabbits you may wish to have a litter pan outside of the cage. A litter pan outside of the cage should be cleaned daily. Also, if you have dogs or cats in the house, you may want to cover the littler box with a piece of cage floor wire. If you do not, the cat may decide to use the litter box as well or the dog may decide to eat feces from the litter box. A piece of cage floor wire (1â€� X Â½â€�) can be fitted into a litter box and some supply companies sell litter boxes built like this for rabbit owners. Every rabbit has a different personality and you will never know until you get to know your rabbit what to expect from yours, so it is wise to rabbit proof your home. Rabbits have been known to pull up and chew carpet, baseboards, draperies, and even electrical cords. While there are ways of dealing with each of these situations consider whether you are prepared to compromise to whatever extent is necessary in order to provide a quality life for your rabbit. Remember anything low to the floor, books at the bottom of a book case, magazines, even shoes may peak the interest of a playful rabbit and be at the mercy of a female in a nest building mode. Rabbits can learn to use a litter box, to come when called, and to adjust to a routine. Rabbits can be the ideal pet for those who work out of the home during the day as they tend to be most active in the early morning and in the evening and are quite content to spend their days dozing in their cages. Rabbits may not reach their full potential for a relationship with a human until they have reached the adult stage (5 to 9 months). For this reason the adoption of a six month or older can be very rewarding. If however the rabbit has had little or no experience with human contact before this time bonding and training can be more difficult. 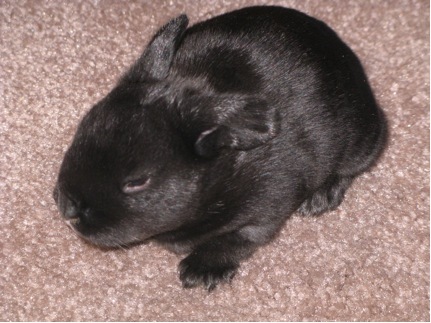 Older rabbits are often more easily litter box trained. Rabbits reach their peak of curiosity and hyperactivity at 4 to 8 months. A rabbit that is to be strictly a pet in the home should be neutered. A neutered male will less likely to spray. A female that is spayed will not develop uterine cancer, which could be fatal. If you bring a rabbit into your home, be prepared for an experience that will highly enrich your life. But also be prepared to change your life to accommodate theirs if needed. Contact Us for more info or to purchase a rabbit. The American Rabbit Breeders Association, Inc.
Template based on "Yellow Flower". Graphics are orginal designs by Lisa Shea. CSS was added to create "Blue Bunny"